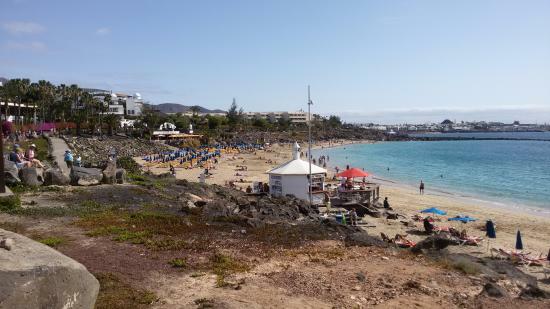 Playa Blanca is a beautiful southern town on the Spanish island of Lanzarote. Awarded many times for its peaceful tranquillity, it has now become the third largest tourist area on the island - which comes as no surprise as it's the ideal place for the whole family to relax in. You will find a whole host of restaurants, bars and shops along the Playa Blanca boardwalk, and the streets running parallel to it, at the edge of the old town. The recreational port is also a must visit with many activities to get involved in. 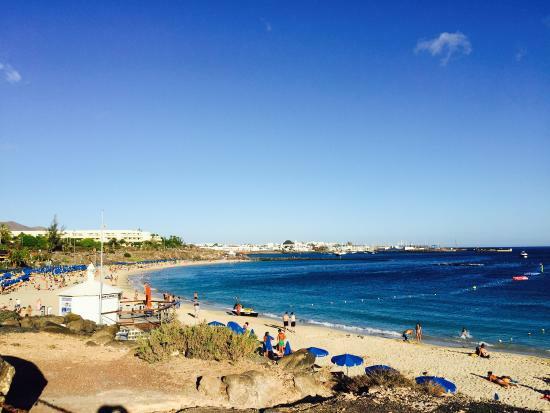 Playa Blanca boasts a selection of bars, restaurants, businesses and is known as one of the best recreational ports in Lanzarote. It is also surrounded by many beautiful beaches where white sand and clear blue waters wash against the rocks. Being very familiar with this area (and the surrounding) whilst having many villas to rent in Playa Blanca, we thought it made sense to put together a guide of must-see and must-do things for everyone to enjoy. The Playa Blanca carnival is an annual celebration packed with culture, diversity and entertainment which includes a flamboyant street parade, colourful dancers, performers and prizes to be won. This year was a “Rock n Roll” theme and the theme of the carnival changes each year. Find out more about this year’s itinerary here. mysterious UFO sightings in the past. This volcano is situated in the far South of Lanzarote and to walk around it fully is roughly 3km. Although a fairly steep incline, travelling up the path would be suitable for most to manage, all we would say is take your time up and enjoy the view. This walk can easily be extended along the Playa Blanca promenade or taking the track down to the coast behind. 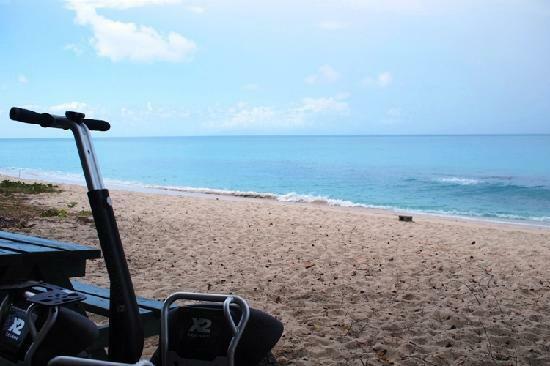 In this magnificent setting, in the heart of the tourist centre of Playa Blanca, Marina Rubicón has (since 2003) complemented and improved its facilities to become a commercial, sports and leisure centre of the highest level accessible to everybody. 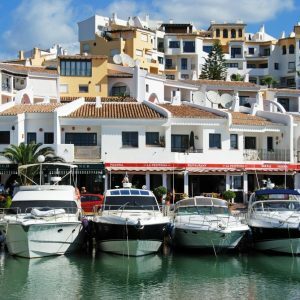 You can enjoy activities of all kinds including nautical sports, activities and excursions, plus everything that both Marina Rubicon and Marina Village have to offer. Every Wednesday and Saturday, from 9am til 2pm, you can enjoy the wonderful Marina Rubicon Market, which offers a huge variety of stalls with local products from island traders. Castillo de Las Coloradas aka Las Coloradas’ Castle is located on the promenade not far passed Marina Rubicón towards the town of Papagayo. It was built near the primitive Rubicón Tower and was constructed by Jean de Bethencourt during the first settlement of Europeans in Canarias in 1402. It is nowadays historically conceived as one of the most outstanding archeological structures in Lanzarote. Fuerteventura on the other It makes a great cultural stop if you happen to be walking along the Playa Blanca Promenade. The natural, beautiful swimming pools of Los Charcones can be found in the south of Lanzarote and only a five minute drive from Playa Blanca. A vast selection of pools of various sizes, depths and shapes are a joy to see. Los Charcones has everything you need to relax, sit back and read a book or enjoy the visuals with your loved ones. 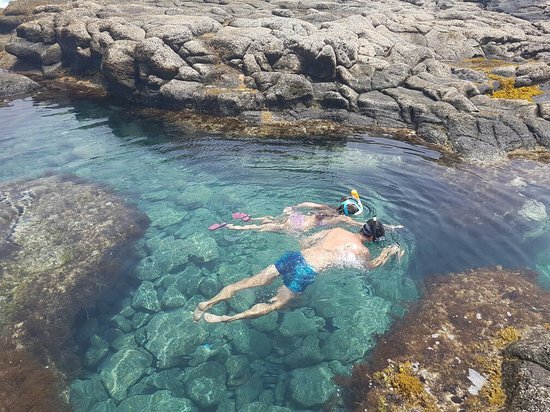 With pools for relaxing swims and separate diving areas, there is a constant trickle of natural swimming pools along almost two kilometres from the Pechiguera lighthouse. natural design that we can confidently say will win you over! volcanic landscape, that covers almost a quarter of the entire island, was created over six years of near-continuous volcanic eruptions. million people visited this unique landscape that is home to a sea of colourful volcanoes and spent cones. The heat just below the earth's crust is still so intense that the restaurant at Timanfaya uses an opening in the ground to grill meat and fish that they then serve to diners. Go into the grill room and experience the heat for yourself! Janubio salt flats are the biggest salt flats still producing in the Canary Islands. Their amazing colours are a must-see for tourists in Lanzarote. 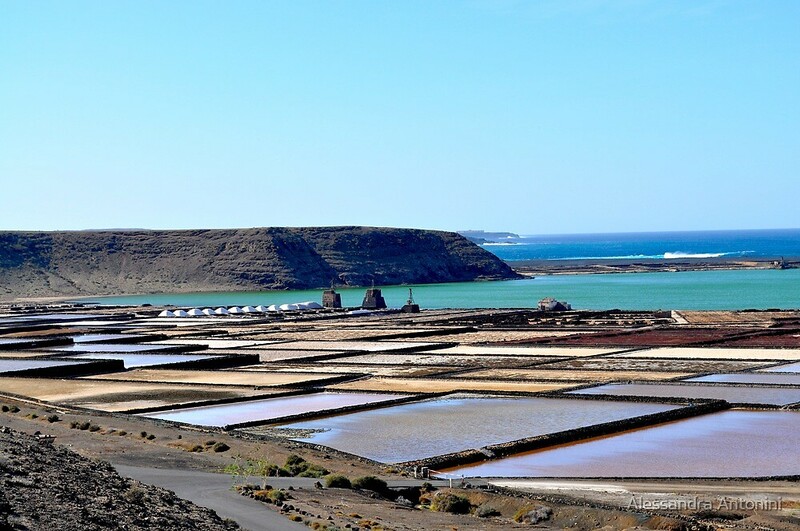 The salt industry used to be very important in the Canary Islands but sadly most of the old salt pans have been destroyed and constructed over. Interesting fact; the now tourist town of Costa Teguise used to be filled with giant salt flats. The Janubio Salt Flats’ warehouse is open from 7:00 am til 2:30 pm every day for all to browse and buy their products. 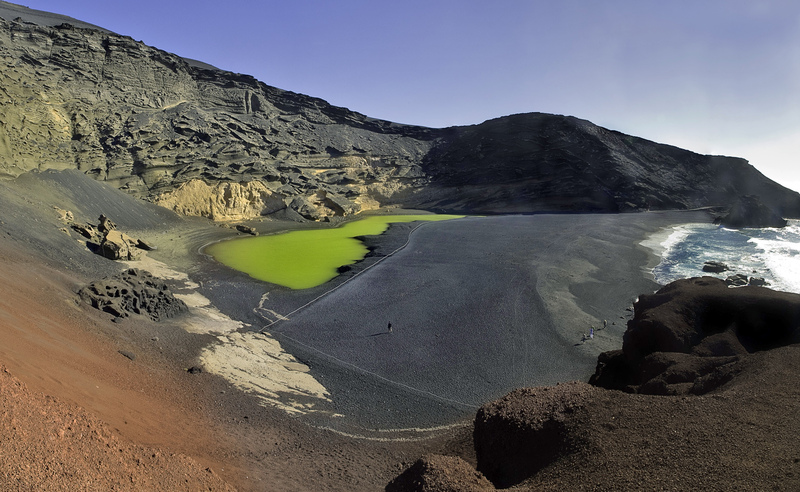 One of the principal attractions at El Golfo is the famous Green Lagoon - an incredible phenomenon in the cove, where sea water is trapped in the form of a lake and has turned a wonderful acidic green colour, due to the algae which lives and grows there. further enhanced by the large rocks which sit just off the beach and causes the sea to crash around them. 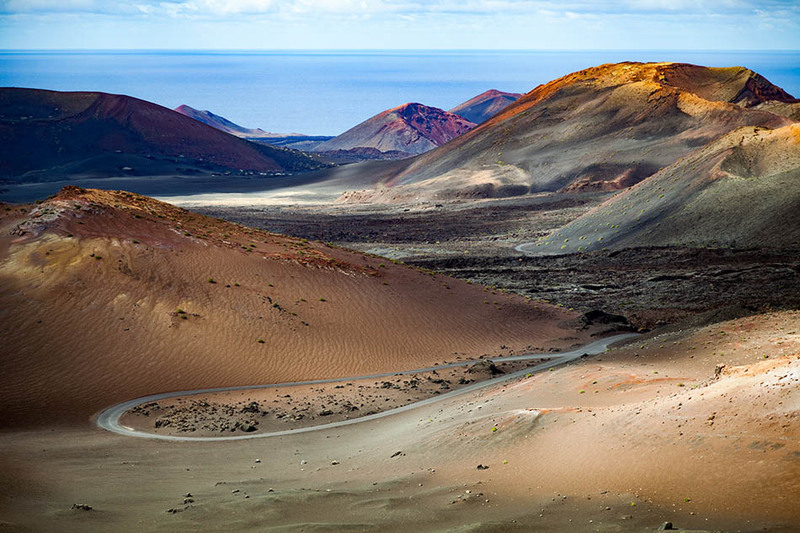 If driving, you'll travel through part of the Natural Volcano Park, which encircles the Timanfaya Park on all sides, to reach this little village. holidaymakers for the strange yet wonderful views on show. 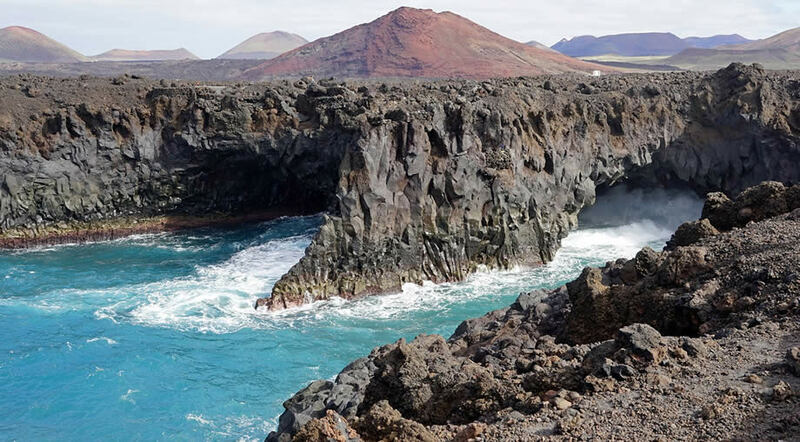 This coastal area boasts an abundance of underwater caves produced by the solidification of both lava and erosion. Los Hervideros refers to the amazing display that sees the waves force water into the area of caves with such power that it appears as if the sea is boiling. description thanks to it's warm sands with fantastic shades of agave. The sea around Playa Dorada is generally calm and it is a popular spot with residents who like to get up early and take a morning swim. The beach isn't too far from the main resort area of Playa Blanca and is well served by shops, cafes, bars and restaurants. Maritimo is perfect for soaking up some rays whilst enjoying picturesque sea views. The promenade is the main feature here which boasts a lovely stroll and even more beautiful views to feast your eyes on. Simply delightful, a place you must visit! Just a few minutes walk to the west of the town along the sea-front, you will find the Playa Flamingo beach which is also very clean, safe and family-friendly. Although outside of the town centre, you can still find a number of shops, restaurants and bars to satisfy your needs during the day. Playa Blanca Beach (also known as The White Beach) has a European Blue Flag for cleanliness and is at the heart of the town. It’s central location means you won't ever struggle to find any bars, cafes and restaurants as well as other shops and amenities that are often needed, to make your sunbathing a stress-free pleasure. Although rather small, this beach is a favourite amongst locals and visitors, as there is plenty to see and an ideal place for those who love to do a bit of people watching. reality, it's actually a collection of small beaches that are all separated by high cliffs, forming a number of lovely sheltered bays. The area has been well protected and is now also a national park which can be accessed via a dirt road (there is a small charge to use this route) or by the coastal pathway which starts at the eastern end of the resort. You can also reach Papagayo via a Water Taxi from the harbour in Playa Blanca, if you're feeling fancy! Always wanted to get up close and personal with sea creatures? You'll be happy to know that there are many ways to endure some deep-sea diving whilst staying in Playa Blanca. experience that allows you to discover the underwater world. 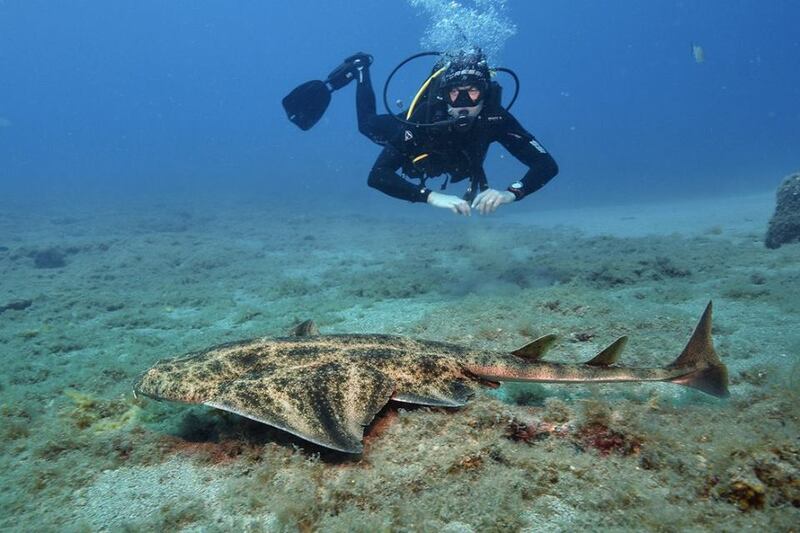 Many have commented on seeing animals including the octopus, angel shark and barracuda. We'd recommend contacting a dive master if you'd like to learn more about how you can get involved. Submarine Safaris are a Lanzarote based company that offer "an underwater experience of a lifetime" - and according to many other tourists, a submarine tour makes for a wonderful family day out for both adults and children to enjoy. bottom of the Atlantic Ocean, and of course back again. operation in 2007 on the island of Tenerife in Marina San Miguel, situated in the south of the island. 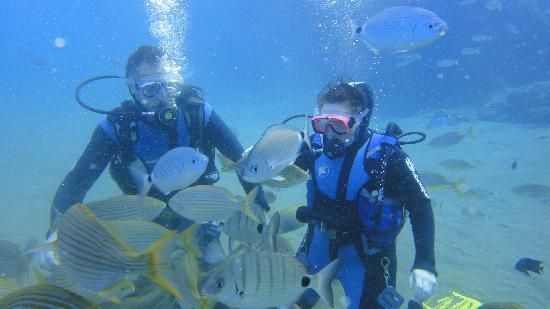 Dive College Lanzarote offer a whole host of activities including guided boat and shore dives (for certified divers), guided dives to Museo Atlántico and even dives in the sea for absolute beginners. There location is unique as they are the only dive centre in Playa Blanca that is situated directly on the beach (perfect!). This direct access is a huge advantage as you can quickly get to all dive sites, meaning no time-consuming transport to and from each site. Visit the website for more details on how to get started. 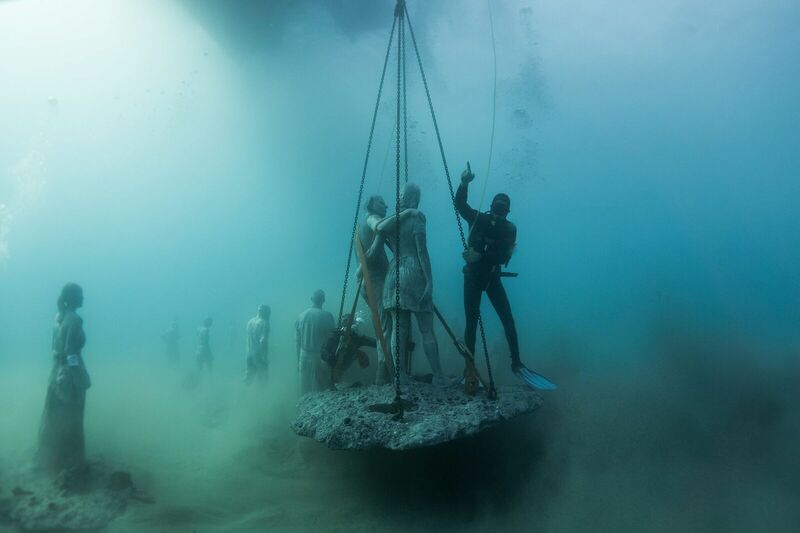 The Museo Atlántico in Playa Blanca is the only underwater sculpture museum that exists in Europe and has only been open to the public since March 2016.
creations of artist Jason deCaires Taylor who is renowned for his underwater art. The underwater museum in Lanzarote is situated in a well protected area near Coloradas at a depth of 15 metres. View local attractions and landmarks in a completely different way by gliding through a fantastic off road adventure with Moving Segway Lanzarote. ​Enjoy spectacular views and take in all the scenery of the wonderful Papagayo beaches or visit a site of indigenous people and huge volcanoes. Whether you're after a relaxing stroll across the seafront or an interesting historical adventure filled with culture, these guys will provide! For full prices and times, visit the website. Explore the famous south coast of Lanzarote and take in the gorgeous golden beaches of Papagayo on a luxury catamaran. snorkelling or do some dolphin spotting on a jet ski, all of these boxes can and will be ticked! It's also worth noting that adult-only cruise are available with luxury champagne cocktails provided along with Ffree pick up from Playa Blanca, Costa Teguise and Puerto del Carmen. offering all kinds of local produce and handmade crafts goods including perfume, jewellery and clothes that can be purchased at reasonable prices. We highly recommend visiting the Teguise Sunday Market, a place filled with colour and vibrancy, where you can buy many interesting souvenirs, crafts and local produce (traditional wine, cheese and sauces) which make tasty reminders of your stay in Playa Blanca. The shopping districts﻿ in Lanzarote are located in the main resorts of Playa Blanca, Puerto del Carmen and Costa Teguise. Windsurfing Club Las Cucharas has been a part of Lanzarote for over 25 years offering the best in windsurfing lessons, rentals and much more. water including stand up paddle, kayak and of course, surfing. Boasting a variety of 10 surf spots throughout Lanzarote, Kaboti Surf invite you to "feel the spirit of surfing" in Lanzarote by offering you the best opportunity to have an unforgettable surfing experience. Although there are few places to kite surf in Lanzarote, the natural volcanic landscapes with the April to October trade winds, make for an unforgettable kite surfing experience. Famara is known as "Lanzarote's king of the kite surf beaches" and at a whopping 4km in length, there is room for everyone. All the kite surf schools are based in the small village of Caleta de Famara - make sure you shop around to find the right one for your level of experience! If you want to experience a completely different view of the Playa Blanca area, Stand Up Paddle (or SUP) is the choice for you. 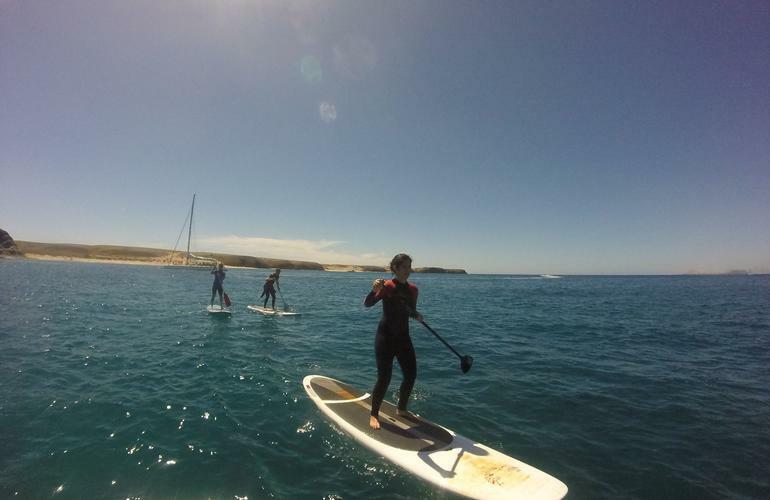 having someone supervising you for safety, Wind Blue Sports offer SUP initiation lessons which couldn't be better for beginners. Whether your plan is to have a view of Playa Blancas' promenade or the main beaches in the area, get in touch to find out how you can get involved. Barney's bistro﻿ and music bar boast spectacular sea views of the Marina and Fuerteventura whilst offering you a range of cocktails and pub grub style food to feast on. They are located in Centro Comercial Papagayo which is right next to the main Playa Dorado beach, Playa Blanca. They even offer live music every night which is ideal for those who like to watch local musicians in action. 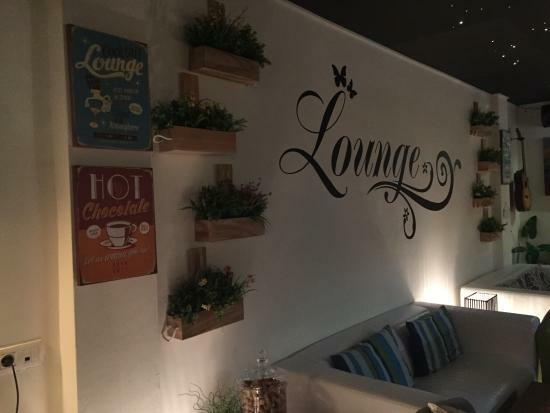 The Lounge Bar is a fantastic bar made to chill-out in and is located in the heart of Faro Park. They offer a range of ice-cold beers served in frozen glasses, great selection of classic and modern cocktails, wines and speciality gins. If you're out for a few quiet drinks, this is the place to be. Looking for a place to drink with a big atmosphere and plenty of places to sit and relax? We have a feeling you'd enjoy the Jungle Bar Terrace. They also play the biggest and best sporting events shown on 5 big screens in various locations throughout the space - good to know if you're on holiday and need a place to watch the football! 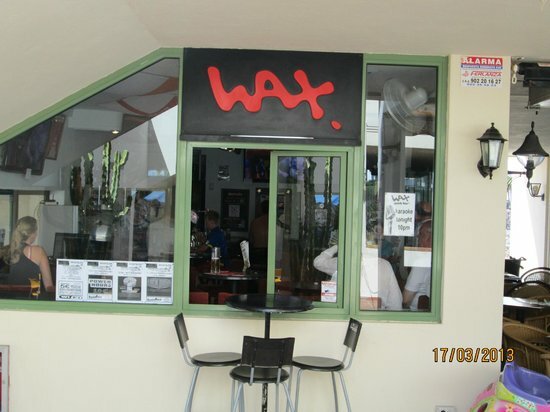 Wax Bar opened there doors in May 2005 offering a unique experience on the island with an open invite to all. Known for it's relaxing atmosphere, big screens, comfortable seating and a wide variety of drinks to choose from – it's the go to place for many who visit Playa Blanca. 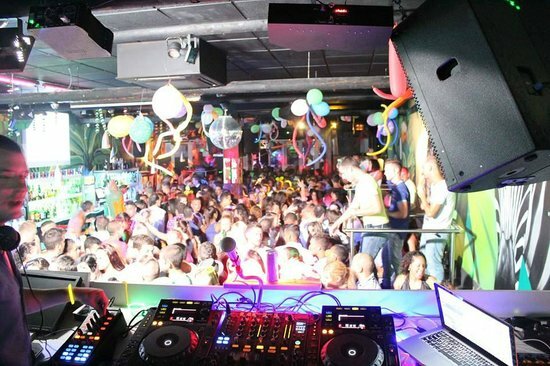 The bar is located in Centro Comercial Papagayo (the commercial centre) which is situated behind Playa Dorada, the biggest beach in Playa Blanca. 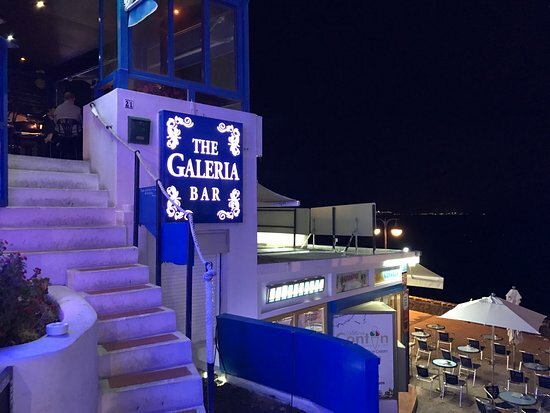 Sit back and relax with a cold drink whilst enjoying the beautiful sea views on the roof top at The Galeria Bar. This gorgeous little hidden gem of a bar isn't the biggest in Playa Blanca by anyh means, but the stunning views out across the ocean make up for the lack of space. The staff are friendly, welcoming and are more than happy to help you choose from an amazing selection of cocktails.